I was thrilled to be part of the Jersey Bites Cooking Stage at the annual NJ Home Show this weekend! Loved meeting so many wonderful people from my home state and sharing healthy cooking tips, easy ideas for no-sweat entertaining, and kitchen hacks to help them feel like rock stars in the kitchen. One of my top tricks for getting the tastiest results when cooking veggies? Try roasting them on parchment paper! It gives them a nutty flavor that appeals to even the pickiest of eaters with easy cleanup for you. This rich, hearty, dairy and gluten free soup uses cauliflower in two awesome ways, pureed into the broth for thickness and roasted to add at the end for incredible flavor. Feel free to add any mix of veggies you like at the end of cooking! Baby spinach, diced peppers, and diced carrots would all work well. Add remaining 4 c raw cauliflower florets (frozen cauliflower makes a fine substitute too!) and broth to pot; increase heat to high and bring to a boil over high heat. Reduce heat to medium-low; simmer, uncovered, until cauliflower is extremely soft, 15-20 minutes. Puree soup in pot using an immersion blender (or puree in batches in a countertop blender); stir in tomatoes, chick peas, and green beans. Cook, uncovered, until green beans are tender, 10 minutes. Stir in lime juice and roasted cauliflower; sprinkle with cilantro. Use a microplane grater to make quick work of mincing your garlic! 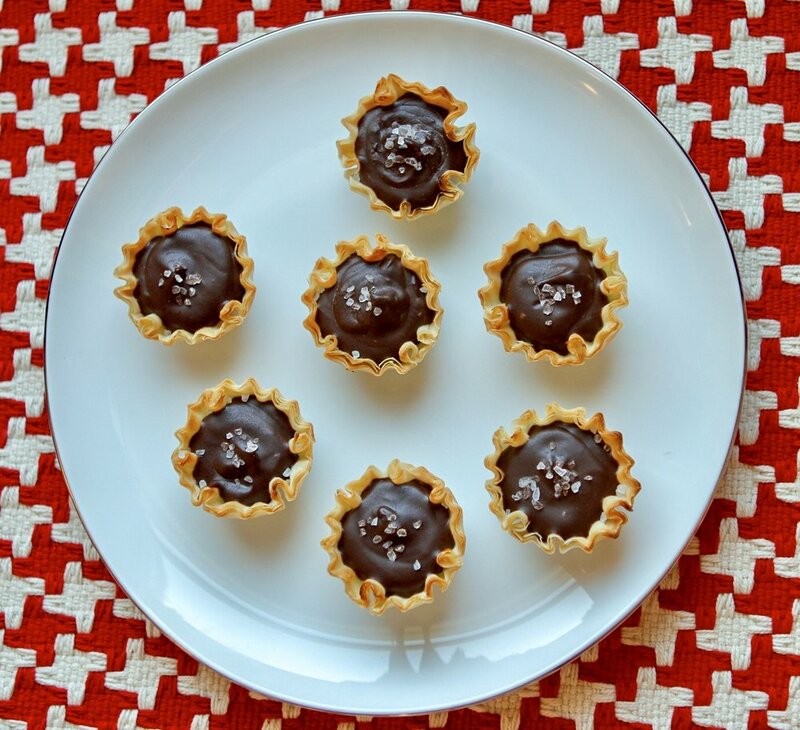 Dark Chocolate Sea Salt Mini Tartlets: an easy 5 minute treat that's perfect for Valentine's Day or parties too! These just-right-sized dessert bites feature a rich simple ganache filling paired with a dusting of salt. Perfect for a party or to pair with a nightcap…plus these treats only take minutes to make! Preheat oven to 350ºF. Bake fillo shells on a sheet pan for 5 mins to crisp. Combine cream and butter in a small saucepan over medium heat stirring occasionally, until butter melts. Reduce heat to low; stir in chocolate and bourbon until combined. Let chocolate mixture cool slightly & spoon 2 heaping tsp evenly into shells. Sprinkle tarts with optional salt; chill until filling sets, about 10 minutes. Substitute other liqueurs or flavored extracts for the vanilla extract for a fun flavor twist! Brandy, Peppermint Scnapps, Vanilla Extract, Dark Rum, Framboise, or Coffee Liqueur would all be delicious! Mini Cardamom-Spiced Apple-Cherry Crisps are great for parties. They won’t know what’s different about this version of everyone’s favorite apple crisp – they’ll just know it’s fantastic! A mix of apples tossed with dried cherries, orange, and cardamom lend this staple an exotically delicious edge. Note: This recipe is easily doubled or tripled to feed a crowd. Preheat oven to 375 degrees. Combine cherries and orange juice in a small glass bowl. Microwave for 2 minutes or until heated through and cherries soften. Toss together orange/cherry mixture with remaining filling ingredients in a medium bowl. Fill 4, 4 oz ramekins evenly with filling. To make topping; combine flour, oats, and salt in a small bowl. Drizzle with melted butter and toss with a fork to combine. Evenly divide topping across filling, patting down to set. Bake for 25-30 minutes or until apples are soft and topping is beginning to brown. Looking for a tasty, healthy, easy, no-cook, make-ahead, grab-and-go breakfast or snack option? (Sounds pretty darn perfect no?) Try my Easiest-Ever Overnight Oats! Full of fiber, super-satisfying and the perfect blank slate for any flavor or topping combos you like. Make up a batch in small cups meal-prep-style and you'll have your mornings fueled for the week! The only recipe you need? ½ cup Old Fashioned Oats plus ½ cup your favorite milk & optional sweeteners or spices. Mix together, cover, & refrigerate overnight for perfectly tender oatmeal in the am! To mix things up try plain or vanilla almond milk, coconut milk, regular lowfat milk, or even chocolate milk! Stir in optional cinnamon, ginger, vanilla extract, almond extract, nutmeg, maple syrup, brown sugar, or honey for flavor & sweetness. To make it European muesli-style just stir in some plain or flavored yogurt before soaking for a delicious tang and creamy texture. Fresh or dried fruit is a classic! Try dried cranberries, raisins, currants, cherries, chopped dates/figs/apricots or any fresh fruit you like! This is also the perfect time to use frozen fruit - just stir in to soak with the oats and they’ll be perfectly juicy come morning! A dollop of your favorite jam or drizzle of honey makes a sweet & luscious topping. Create crunch with a dusting of toasted nuts , coconut, or granola. Craving something warm and comforting? While overnight oats are delicious chilled or room temp just heat them briefly in the microwave in the morning to warm. Super Swap: Sweet Potato Toast! Give your favorite breakfast toast a fun and healthy makeover by swapping in superfood sweet potato toast for the bread. Just pop slices of sweet potato in your toaster or toaster oven for a tasty, gluten-free, lower carb toast alternative in minutes. Try my classic Bacon Egg & Cheese on Sweet Potato Toast or see below for other topping ideas! Place sweet potato slices in toaster or toaster oven and toast on highest setting until lightly browned and fork tender. It may take two or three rounds depending on your appliance, just flip slices each time for even toasting. While potatoes are toasting fry eggs in a nonstick sauté pan coated with cooking spray to desired done-ness. Top each sweet potato slice with 1 TB shredded cheddar, 1 slice crumbled bacon, 1 fried egg, and 1 TB scallion. Other flavor ideas? Try your fav mashed avocado or guacamole with chopped veggies to top your sweet potato toast...or for a sweet spin spread with almond or peanut butter and banana or apple slices. My So Simple Chicken Tortilla Soup is a fantastic way to spice up leftover chicken; or pick up a rotisserie chicken for an easy 8 minute dinner anytime. Also perfect for meal prep! Set up a fun nacho-style toppings bar (ideas below) to let everyone customize their own bowl. It’s a great way to get kids to try new things too! Heat olive oil in a soup pot set over medium-high heat. Add onion and salt and cook for 3-4 minutes or until onion is softened. Add garlic and ancho chili powder and cook for 1 minute. Add broth, tomatoes, black beans, chicken and lime juice. Increase heat to high, cover, and cook an additional 2 minutes to heat through. Stir in cilantro and serve topped with optional garnishes. Ancho chili powder has a light heat & slightly fruity flavor – it’s a great spice to add to your pantry! One of the keys to sticking with a healthy eating resolution is to plan ahead to cook more meals at home. My filling and flavorful Greek Shrimp & Rice Bowls are the perfect solution! They’re wonderful to make-ahead “meal prep style” for at-work lunches and are also an easy-speedy weeknight supper. Equally delicious chilled or warm – plus pantry staples seriously slash prep time. Line up 4 medium bowls or storage containers. Evenly divide ingredients across all 4 bowls in even piles. Whisk together vinaigrette ingredients and drizzle evenly over the top. Sprinkle with optional garnishes. To make this even lower calorie and lower in carbs just swap in 2 cups of cauliflower rice for the brown rice. If your store doesn’t sell cauliflower rice you can easily make your own by grating a head of cauliflower or pulsing florets in a food processor. Always keep a bag of pre-cooked frozen shrimp on hand. Just run under cool water for a few minutes to defrost and they’re ready to enjoy! My so-easy & so-delicious Slow Cooker Red Lentil Coconut Curry Soup will make you feel good in more ways than one! Healthy, hearty, gluten-free, dairy-free, just 5 mins of prep, perfect for Meatless Monday AND an easy way to help feed those in need this Holiday Season! I’m so happy to help Goya Foods share an opportunity for you to support a wonderful cause thru their Goya Gives “Can Do” program! For every can of Goya Coconut Milk purchased this month (like I use in this recipe!) Goya will donate products to Feeding America to be distributed to families in need. How To: Combine ingredients in your slow cooker & cook for 6 hrs on low or 3 hrs on high. Done! Serve garnished with lemon wedges and cilantro. Also excellent on top of Goya rice! Whether you want some mixology inspiration for your party...or just need a cocktail for yourself - you're sure to find a favorite among my 12 holiday-themed drink recipes. With everything from a perfectly-retro & party-ready punch to elegant martinis & "hey-why-not" shooters...I guarantee it won't be a Silent Night! This is the dessert recipe you need this year! Whether for your own festivities, to bring to a friend's gathering, or to give as gifts...my Super-Decadent Candy Cane Brownies will make everyone's holiday much sweeter. Simple to make, rich and decadent, and sure to be appreciated by all. They're a fun project to do with the kids, yet pretty and party-perfect to pair with with after dinner drinks at an adult bash. Chef Tip: Swap out the semi-sweet chocolate chips with an equal amount of your favorite dark or bittersweet chocolate for an even richer result. Preheat oven to 350 degrees and grease a 9”x13” baking pan. Combine butter and bittersweet chocolate in a large heat safe bowl set over a pot of simmering water and melt, stirring often, until smooth. Let cool slightly. Beat together eggs, sugars, vanilla, peppermint extract, and salt in a large bowl and whisk into chocolate mixture. Fold in flour until just combined. Spread batter into prepared pan and bake for 30 minutes or until set in the middle. Let brownies cool completely. Place white chocolate chips in a large heat safe bowl set over a pot of simmering water and melt, stirring often, until smooth. Use a spoon to quickly drizzle white chocolate evenly over the top of the cooled brownies, then sprinkle with candy cane pieces. Let chocolate set before cutting brownies into squares. Cheesy Cauliflower Gratin with Crunchy Panko Topping: A mix of cheeses is the secret to this dish's decadent-seeming cheese sauce. Pecorino cheese & panko breadcrumbs work magic together as a crispy topping. Sneakily-Rich Butternut Squash Bisque: One of my all-time favorite secret weapons when lightening up recipes? Blend Greek Yogurt into the finished result for a rich finish instead of heavy cream. This recipe is delish as is...but feel free to spice it up with fresh ginger or go exotic with a dash of my current spice-blend obsession - Ras el Hanout. Extra points for serving in teacups or fun shot glass portions. Roasted Pear Salad w Gorgonzola, Pecans, & Maple-Balsamic Dressing: This gorgeous, upscale salad would be welcome at any holiday dinner. To lighten it up even more & slash prep time? Use your favorite light balsamic dressing...it's ok...I won't tell! Cardamom Spiced Apple-Cherry Tart: Don't worry...you don't need to skip dessert! This so-impressive yet so-simple tart is WAY lighter than traditional apple pie. Phyllo dough is the secret for a low-fat, crisp crust, with no rolling required. My Top 12 Recipes for an Epic Super Bowl Bash!!! It's time to get set for The Biggest Sunday Funday of the Year!!! No need to pour Doritos & call for Dominos - try some of my fun and easy game day recipes, kick back, and enjoy the big game! From potent cocktails & simple slow cooker dishes that feed a crowd, to fun party apps & adorable sweet treats...I've got you covered with plenty of easy options for your party or to bring to a friend's. Just click through the photo to get the recipe! Super Bowl parties pretty much begin as a football-centric brunch right? Kick things off properly with a batch of my Spicy Sriracha Bloody Marys. I'd consider these Mini Mexican 7 Layer Dips a party must-have! They stay pretty and allow for double-dipping with wanton abandon. Even better? This one is a Weight Watchers recipe so it's sneaky-light too...shhhh! Let's move on to two awesome "feed a crowd" slow cooker main dish options...so you can chill & watch the game too vs being stuck in the kitchen. Just set up a fun fixins bar next to that bad boy & you're good to go! A big batch of Beer Braised Pulled Pork Tacos will be appreciated by the carnivores & Mexican food lovers in your crew.... just setup a toppings bar, kick back, & enjoy the party! Vegetarian or health-conscious friends in the house? Go for my Spicy Vegetarian Chili recipe for Weight Watchers. It's satisfying and substantial without breaking the calorie bank & the perfect base for fun toppings. Macho Mango Salsa is perfect to bring to a friend's party or to serve as a topping for my Pulled Pork Tacos or Spicy Veggie Chili. Why "Macho"? This one packs a punch! What is it about football watching and Tex-Mex food? Doesn't matter if it's guacamole, nachos, soft tacos or chili - it's always a fan fav. Mix up a big batch of my crazy-delicious & dangerously potent Lose Your Shoes Margaritas to get the party rocking. A pretty & fun take on your standard sub sandwich - these deliciously savory Italian Sub Skewers are an easier to eat party bite that satisfies all your sub cravings! Two classic stadium snacks are even better together! My Pigskin Pretzel Dogs are the perfect mashup of hot pretzels & hot dogs. Tip: Cross slice them into quarters to serve as a fun take on Pigs N Blankets - easy to make ahead & tote to a party too. Burgers are a tailgate-style staple & sliders are the perfect snack-sized option for party noshing. My Bacon Cheddar Sliders with Chipotle Sauce totally bring it! Instead of the usual wings - try making up a batch of my Crispy Buffalo Chicken Tenders w Blue Cheese Dipping Sauce. Less mess & easier to eat too! Gotta have some Sweet Treats to make you a 4th Quarter Hero! No matter what the game or party pool outcomes are...these are sure to send everyone home with a smile. They'll never guess that these Mini Peanut Butter Pie Ice Cream Sandwiches are one of my most popular recipes for Weight Watchers. Crazy delicious & ridiculously easy. Make extra...trust me! Seriously...who could possibly resist this chocolatey cuteness? Decadent Chocolate Football Cake Pops are a total touchdown for your bash. Headed to a friend or family members' for Thanksgiving? If you're stumped or stressed about what to bring I've got some easy, travel-friendly ideas for you! These recipes are all simple to prepare, can be made ahead, are total crowd pleasers & will definitely be appreciated by the host. Orange and Fennel Marinated Olives make a great hostess gift, to nosh at Thanksgiving or break out for guests throughout the holiday season. Bring in a pretty mason jar tied w a bow. A guaranteed crowd pleaser - my highly addictive Sweet & Spicy Glazed Nuts w Cranberries & Rosemary make a much appreciated hostess gift or cocktail nibble. Trust me...bringing booze always makes for a happy host! Instead of the usual bottle or two of wine, why not blow them away with this killer Winter Spiced Sangria instead? Pack in a portable beverage cooler for easy transit. Nobody can resist! Mini Pumpkin Cheesecakes make an adorable & delicious finish to any holiday meal. Tote them along right in a disposable cupcake tin - no risk of crushed cake upon arrival! Think outdoor entertaining is only for summer? Not so! September and early fall offer the perfect opportunity to use your outdoor space to the max. Friends and family have all returned from summer adventures and are eager to get together for some fun...not to mention cooler temps keep things way more comfortable than hot summer nights! Easy ideas to Funk up your BBQ Favs! Hosting a BBQ this summer? Instead of making the same-old same-old take your summer favorites up a notch! Check out this series of recipes I recently did for Bed Bath and Beyond for some easy ways to make your BBQ favs a little more fresh & fun. Happy Summer!